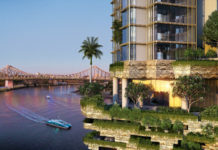 Three iconic sculptural residential towers known as Grace on Coronation that deliver public parkland and access to the inner city riverfront are expected to get the go ahead from Brisbane City Council tomorrow (Tue 2nd June). Lord Mayor Graham Quirk said the project would provide community access to the majority of the 1.5 hectare site at Toowong that was formerly the ABC’s State headquarters and for the first time open up the 1860s riverfront villa Middenbury House to the public. 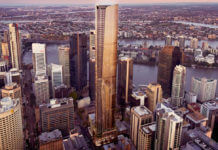 Cr Quirk said renowned British-Iraqi architect Dame Zaha Hadid was behind the design of the $430 million Grace on Coronation project that tapers each of the glass towers to minimise their footprint and open the riverfront to the community. The proposal is expected to get the green light from Council’s Neighbourhood Planning and Development Assessment Committee tomorrow (Tue 2nd June) with the first stage of construction forecast to commence in late 2015. 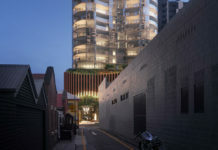 It involves the construction of three residential towers, two of 24 levels and one of 27 levels, containing 555 units and the reuse and extension of the heritage-listed Middenbury House but does not permit a request for traffic to turn right from the site towards the city. 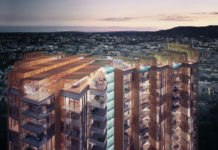 “The three building project has enabled almost 60 per cent of the site (8,868 sqm) to be publicly accessible with landscaped pathways, a connection to the Brisbane River frontage as well as protecting two heritage sited fig trees,” Cr Quirk said. “The project will provide an extension of the Bicentennial Bikeway along Coronation Drive to Archer Street through the site to improve facilities for pedestrians and cyclists. “The local community wanted more open space and permanent public access to this site and that has been achieved by limiting it to three as opposed to five buildings that retain a total of 75 levels of residential accommodation that the applicant is entitled to under planning laws. Cr Quirk said the site was identified in the Toowong Auchenflower Neighbourhood Plan as a both a ‘landmark’ and ‘catalyst’ site to accommodate buildings that attain citywide prominence through a combination of notable architecture excellence, siting and location. “Council requested the former Federal Labor Government in 2009 dedicate the ABC site for parkland but they instead sold it to the private sector for $20 million but it is pleasing to see the majority of the site will become accessible to the community under this design,” he said. “Grace on Coronation proposes a striking design which is certainly different in terms of its style to what this city has experienced before and there are differing views but it is certainly a one-off design and a unique feature for our city. “The project provides public access to the river’s edge and includes a riverfront café and shaded elevated terrace seating along the pedestrian spine connecting Middenbury House, the central plaza and the river’s edge for people to enjoy the urban common areas. Cr Quirk said the project was the first Australian design by Dame Zaha Hadid who in 2004 became the first female recipient of the Pritzker Architecture Prize, architecture’s equivalent of the Nobel Prize. He said the site owner’s request for a right hand turn from Benson Street to Coronation Drive had been denied because of the unacceptable impact on traffic along Coronation Drive. The Archer Street intersection will continue to function as left in-left out only intersection. The project will add a left turn lane (including 27 metres of deceleration lane) on the outbound Coronation Drive into Archer Street to improve safety and reduce delays and a wider footpath will also be provided along the Archer Street frontage. Grace on Coronation will also provide for 714 residential car parks and 86 visitor car parks across levels of basement car parking and 680 bicycle parking bays including 555 secured residential bicycle spaces and 125 visitor bicycle spaces. Extension of the Bicentennial Bikeway providing a new additional link connecting Coronation Drive to Archer Street through the site. Publicly accessible urban common areas and a riverfront cafe. MAXXI – National Museum of the 21st Century Arts, Rome. Stirling Prize 2010 winner. To view more of this development, visit a previous article here. The Brisbane City Council should be applauded for approving this visionary development which will make Brisbane a lot more of an architecturally diverse and global city. I would love to be the site supervisor for this job! amazing structures.